Amsterdam has an oceanic climate, similar to that of Great Britain. The climate in Amsterdam is strongly influenced by the North Sea. The city is located only 23 kilometers east from the North Sea coastline. 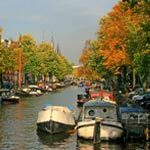 A description of the climate in Amsterdam can be found below including tips for the best months to visit Amsterdam. The weather in Amsterdam is fairly mild during wintertime. However temperatures can drop below freezing. The chance of extreme cold is sporadic. On some days there may be snow fall. 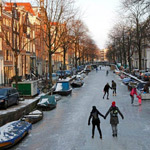 Occasionally the Amsterdam canals freeze. This happened for the last time in February 2012. Many people have used this opportunity to go skating on the canals. Ice-skating is one of the Netherlands most popular sports. 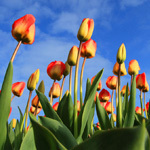 This is perhaps the best time to visit Amsterdam: the famous tulips are in bloom during spring time. The weather in Amsterdam can be wet and changeable in this season but it is also a fresh and sparkling time to enjoy Amsterdam. But still bring your umbrella. Even on sunny days you might be surprised by some rainfall. The months July and August have a nice average temperature but the weather can be variable with temperature extremes. Together with spring this is the best time to visit Amsterdam. 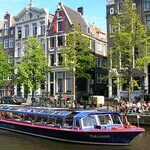 The city gets a great level of sunshine, more than 200 hours per month: perfect weather to relax in the park on a sunny day or enjoy Amsterdam from the water by taking a canal tour. Early autumn, the weather is still very pleasant. Temperatures in September are almost the same as in June. 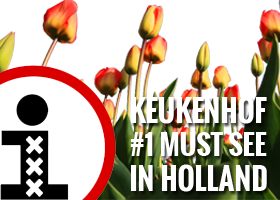 Therefore this is a very suitable time to visit Amsterdam after the peak season. The extreme crowds are gone and furthermore hotel prices are much lower than in during summertime. October and November are by far the wettest months of the year and can be quite windy.